Kindly check and make sure that you’ve installed the updated version of our theme properly. how do you enable icons in the menu after selecting header 2. How do you also customize those icons to different images. Note: If you really like our theme and support, please feel free to give us your best rating (5/5 stars would be much appreciated). We will be more happy,. Note: If you like our theme and support, please feel free to give us your best rating (5/5 stars) !! how did you make the theme responsive? am trying to use media queries to edit the mobile lay out but it is not responding. (a). Go To the Theme Backend (WP-admin) -> ALMS (Buddha Panel) -> “Responsive & Mobile Tab” -> Switch “YES” in “Make My Site Responsive” field. (b). And then, Open “responsive.css” file from “wp-content/themes/alms/css/responsive.css”. Edit the styles, as per your needs. Please update our theme with latest version compatible with wordpress 3.9. Follow the below steps to update the theme. 1. Download the theme from themeforest page. 2. If you have made any custom changes in the code, please take a backup of it. 3. Overwrite the updated theme files to the older theme files. 6. Then Login to Dashboard -> Appearance -> Install Plugins. Install the Designthemes Core Features plugin. Thats it. Now you are updated to the latest version. 7.The latest version fixes your issues. Kindly check your site, as we’ve fixed out the issue whereas the sermons are working fine now. Also, please note that there seems to be numerous plugins were used on your end. We’ve just uninstalled the “Jquery Updater” plugin as there is no need to use it. hi, I got this error ([LayerSliderWP] Invalid shortcode )on main page and slider is not working. If you still have any issues, please let us know your admin and ftp details, so that we can help you in this. Please mail your WordPress and FTP Login Credentials via through the right bottom form @ http://themeforest.net/user/designthemes . We will check the issue and offer you a solution to get rid of it ASAP! 2) The placeholder image was inside the editor, we have now removed it and now you can edit the contents with no problems. Thanks, it seems it’s good to go. Where can I find shortcodes like this ( dt_sc_one_fourth” )? You can get all the shortcodes from the shortcode builder in the editor section. Also you can check our documentation which is sent along with the theme files for more info. 1) Error under (Doctorate Degree) has been fixed. 2) We cannot link a particular section in the home from the menu items. You can only link the whole page. How can I customize icons? Fixed the issue. Please check the attached screenshot for the mistake that you have done. Are you referring to the theme service icons? If yes, you can add any font awesome icons to replace the service icons. Please check this link for the list of font awesome icons. I need to add this icon fa-graduation-cap but when I use it only a blank icons appears. Do I have to replace the font? if so please let me know where this font is located? Just you update the Fonts folder (wp-content/themes/alms/fonts/) in your theme and font-awesome.min.css in css folder (wp-content/themes/alms/css/). We have attached the latest css and font files here. I created the parent menu and the child menu.Meanwhile,I want the parent menu to be unclickable. Could you please show me how to achieve that? Hope that the following screenshot will help you get a clear view . How do I activate the audio player in the Sermon page ? Note: If you like our theme and support, please feel free to give us your best rating (5/5 stars) !! thank you…. As we checked our theme again with 360 px wide responsive layout from our end, we didn’t get any of such issues you’ve mentioned. So if possible, please help us know the application, in which you’ve found such issues actually. Then, we’ll check and help you with those problems ASAP !! Sorry for that, We can’t understand your query. Please send us a clear Screenshot or Video for better Understanding. So that, we can offer you an exact reply ASAP! This http://ubuntuone.com/5wN3K2AhOMBg7R6J6LtfD7 is a screenshot of Causes section of home page, it seems to me the content only uses up about half the horizontal space, what I mean is the content has a left and right margin that is too large, Ive just bought this theme and would like to change this behaviour. Please mail us your site credentials (WP & FTP access logins) or site immediately via the right bottom form located @ http://themeforest.net/user/designthemes So that, we can check and have a clear look on our end. Then we’ll help you get rid of it ASAP !! Please refer the attached screenshot for removing the admin toolbar. Note: If you like our theme and support, please feel free to give us your best rating (5/5 stars) !! thanks in advance.. I am unable to hide or remove admin toolbar from website front end, even while using different computers and browsers. The solution provided in response to User “triHead” does not work when the user is not logged. I need this admin bar NOT to be displayed when no user is logged in.. Please help. Thank you. On Deactivating the “BuddyPress” plugin, the “Admin Bar” disappears. I think there is a compatibility issue here. please resolve. Thanks. Hi Go through the following instruction you get a clear view. Please go to Dashboard -> Settings -> BuddyPress -> Settings at the top un-check Show the Toolbar for logged out users. So that the admin toolbar will be removed for all users. Note: If you really like our theme and support, please feel free to give us your best rating. We’re expecting 5/5 stars, which will be much appreciated and helpful for us to precede support you all. We have noticed that you have provided us 4 star rating. We have helped you resolve your issues and yet you have rated us low. Let us know what is the issue with theme, so that we can resolve the problem. Ratings play a major role in our profile, a bad rating affects the entire theme and our whole profile. Please revise the rating that you have done now. We are always ready to help you. How do I change the font and size of the font in the top bar? You need to edit from the css file. 1) Font Family: wp-content/themes/alms/style.css , line no: 255 (.top-bar). Add font family to the top-bar class. 2) Please check if you have enabled the sticky navigation option from Dashboard -> Alms -> General -> Sticky Navigation. Please check the attached screenshot http://snag.gy/IDNKL.jpg. 3) You can find all the shortcodes from this page http://wedesignthemes.com/themes/alms/shortcodes/ and from its sub menus section. 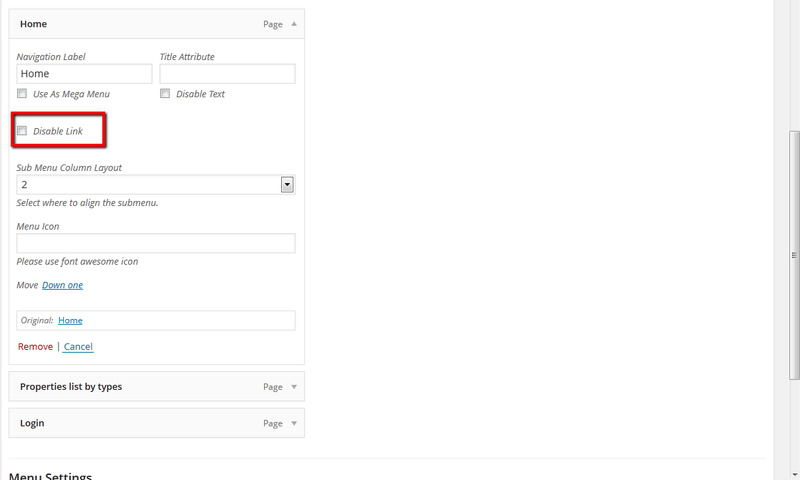 We have attached the screenshot of the footer columns code that we have used in our demo for footer columns 1 and 3. The footer columns 2 and 4 uses the flickr and newsletter widgets respectively. 1) Ill send you details to your email address, but please answer all my questions here. what is the recommended size here? 2) I activated it, it works, 3) My shortcodes page is empty, I can see the child pages of this one accessing through my admin, so thats ok.
when I visit http://wedesignthemes.com/themes/alms/shortcodes/ I only see a blank page with the title Shortcodes, no more. Our main menu in the demo points to this link http://wedesignthemes.com/themes/alms/shortcodes/typography/. We have all the shortcodes listed in the sub menus. Please check it. In this page http://wedesignthemes.com/themes/alms/shortcodes/ we have not listed any shortcodes. It is like a parent page for other child pages. You can remove it from Dashboard -> Appearance -> Menus -> Footer Menu (dropdown) -> Select -> Remove the menus that are not needed -> Save Menu. As soon as I activate the Revolution Slider plugin, the interface on my posts editor changes, and I cant create links in my posts. can you help? In all views of the blog posts, the featured image is shown, including when viewing the blog itself. I have tried setting YES to disable feature image on one of my posts, but then it continues showing the empty box with the word Blog on it (the missing image image), how can I have posts without a feature image? Please use the following shortcode for the gallery items to show. Pls what is the correct image size for the revolution sider and the layer slider( for full width). be having trouble with that as well. You can upload image with any size and you can alter the width from Dashboard -> Layerslider WP -> Edit Particular Slider -> Slider Settings. 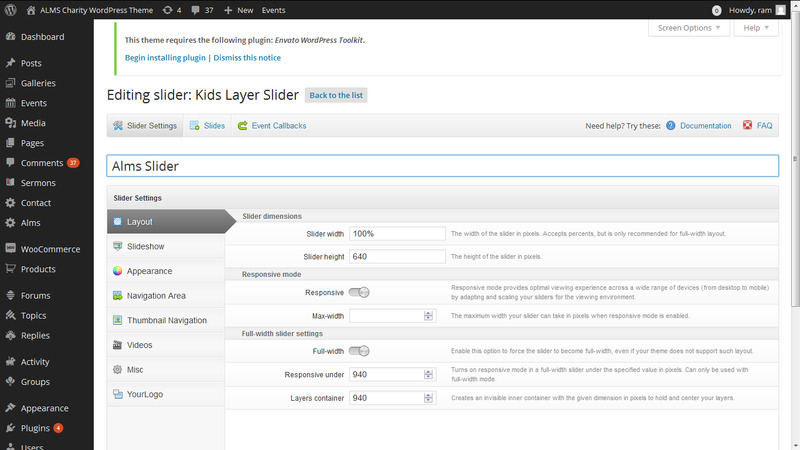 Please check the attached screenshot http://snag.gy/Jw0KM.jpg of the settings that we have for layerslider in alms theme. Though,I have asked this question days earlier but the answer l got did not fix the issue hence l am repeating the question: On my main menu I have created a drop down of child menus from the parent.I do not want the parent menu to respond to clicking only the child menus should when clicked.But now both the parent and child menus are responding to clicking. Could you please tell me how to achieve this?Please bear in mind that your earlier answer did not work. Thanks. Hi. Is there any way to fix this problem: I use Turkish letters, so ” ? ” looks like different in the words (in headers not body) It seems that the font character of ? is different and it is nonbolded.